Yes indeed, the Retina IIIS chrome does shine brightly in this age of plastics. 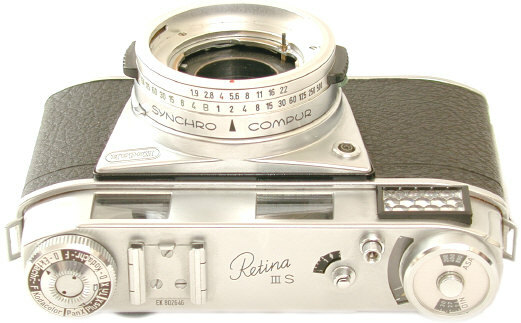 The last of the long lived Retina rangefinder line which started in 1934, about 45,000 Retina IIIS were produced 1958-1960 just as SLRs were gaining prominence. While larger than other Retina rangefinders, the IIIS boasts many improvements, including the largest Retina RF lens selection and the best Retina RF/VF with parallax correction. 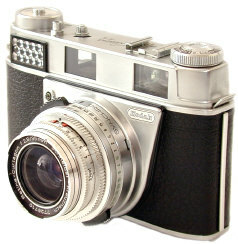 Its body, bottom lever advance, LVS exposure system, and strange frame counting system are very similar to its contemporary folding Retina IIIC. The IIIS boasts a lens lineup of Schneider and Rodenstock lenses from 28mm to 200, with a behind the lens Compur shutter and electronic flash sync at all speeds from 1 to 1/500. The most amazing Retina IIIS feature is cross-platform ability to use IIIS rangefinder lenses on Kodak Retina Reflex S, III, and IV SLRs! Kodak succeeded where Leica, Nikon, and Canon failed: to allow rangefinder shooters to use their lenses with full compatibility on an SLR!! Imagine switching your Leica M rangefinder lenses to your R SLR!! This is a really nice feature!! OK, so Leica did manage it with interchangeable lens heads on some of their 90 and 135 lenses, but Kodak did it with ALL IIIS lenses! Better yet, with a new adapter, it is also possible to use IIIS lenses on many other SLRs. The IIIS Rangefinder/Viewfinder is a nice surprise. It has a bright and usable RF spot, bright and usable framelines, large usable viewfinder and PARALLAX CORRECTION! A clean IIIS finder is very nice, not as good as a Leica M or Bessa R2, but every bit as good if not better than a Canon V or VI, a Nikon S2, S3 or S4, the Leica IIIg, and of course any of the other "Barnack" screw mount cameras. Yep folks, this is an excellent finder in a low priced camera. How did Kodak do it? Well, not for long, it was discontinued after only two years. The IIIS finder AUTOMATICALLY brings up the proper framelines with each new lens, Leica M style, but offers no preview frameline lever. The 35mm frameline appears alone, and remains visible as other lenses are mounted. The 50, 85, and 135 lenses are automatically added to the 35 frame, one at a time. In other words, the visible frameline combinations are 35/50, 35/85, and 35/135. The 200/4.5 also brings up the 135 frameline, at the infinity setting with no coupled RF or parallax compensation. The 35 frameline extends to the edge of the finder, you do need an accessory 28 finder for the 28 lens. IIIS finders have a tendency to fog and flare up over the years. Have it cleaned by a good Retina repairman, and you will be rewarded with a better than average VF/RF. 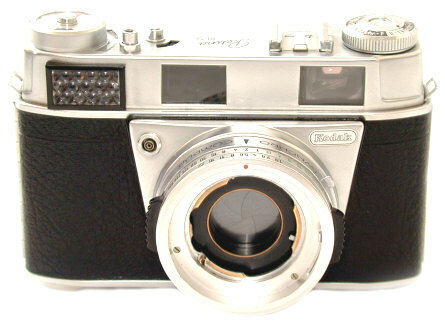 Notice the well laid out shutter and f/stop controls. Unfortunately, they are connected to the outdated and awkward LVS exposure system. With LVS, when you change an f/stop, you automatically change the shutter speed to keep the same equivalent exposure. What a pain. Note the black plastic ribs on the shutter speed dial. Turn those in either direction to change BOTH the shutter speed AND f/stops to give the same equivalent exposure due to the LVS interlock. Want to change that combination? 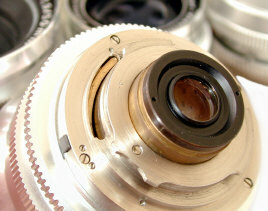 Turn the camera over and you will see the LVS lock, a wheel located at the bottom of the lens mount. Turn LVS lock to change f/stops -- the shutter speed will stay the same. Some people get used to this after a while, but to me it's an awkward pain. 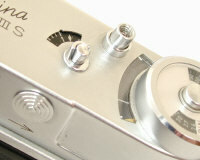 In front of the LVS lock is the lens release. The cross coupled selenium meter, shutter release, and problematic frame counter are pretty much the same ones on the folding Retina IIIC. The meter is usually useless at this point in time, as selenium cells die a slow death with age. IF the meter is still working and reasonably accurate, change the film speed by 1st pushing down on the button atop the ASA dial, and then turning the aperture control wheel on the bottom of the lens mount. The film counter is among the worst ever designed. My theory is that it was really a CIA experiment to find out how long it would take to drive Photogs insane. 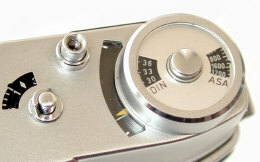 The film counter is manually set by 1st pushing down on that little button besides the film counter, and then moving the nearby chromed button on the back side of the top plate in the direction indicated by the arrow. Each push resets counter 3 frames at a time. That's right, 12 pushes are required for 36 frames, lovely, just lovely. The frame counter shows how many exposures are left on the roll, counting DOWN to 1. It then LOCKS, forcing you to stop and either reload the film, or re-set the film counter to get that extra shot on the roll. Arrgggh. 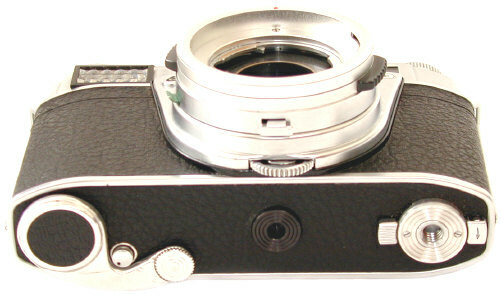 Accessories for the IIIS included a sportsfinder, a table stand for tabletop work, a close-up rangefinder/viewfinder with close-up attachments from 11.5 " to 39 " (29cm to 97cm), a framing close-up attachment which did away with the need for an auxiliary viewfinder, a microscope adapter, the never ready case, and a copy stand which was very similar in concept to the Leica spider legs copy outfit. At least in the US, most of these IIIS accessories are so hard to find I have never seen them. Rare in this case does not mean valuable, just hard to find. However, arguably the best IIIS accessory is one of the possible SLR body combinations to give you easy close-ups and precise viewing when needed. The IIIS probably offers the widest choice of lenses of any leaf shutter 35mm rangefinder, quite an achievement by the IIIS designers. Not only that, these are quality lenses made by Schneider or Rodenstock and they can also be used with full meter and aperture coupling on the Kodak Retina S, III, and IV SLRs. Note each 50 mm lens was available in two different versions with slightly different close focus distances. Engraving differences exist between lenses marked in feet only, meters only, and in both feet and meters. Collectors, if you want a challenge, collect ALL the variations! Only the Schneider versions were officially imported into the US. After the IIIS was discontinued, these lenses continued in production for the Retina IV SLR, WITHOUT the rangefinder cam. 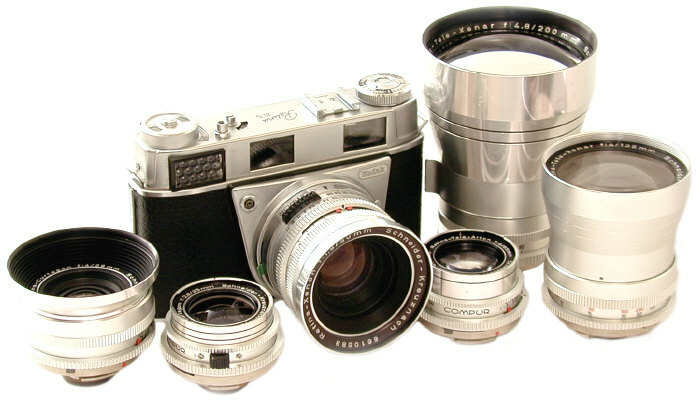 These later SLR lenses will mount on the IIIS but NOT rangefinder couple. Retina IIIS/Retina Reflex lenses have a "Retina-" label on the filter ring. This is important to remember, because the almost identical lenses for the Kodak Instamatic do not use the "Retina-" label and do not have the IIIS rangefinder cam. All IIIS lenses have a f/22 minimum aperture, as well as mechanical, Hasselblad style moving depth of field indicators. To unmount lenses, push in on the release at the bottom of the camera, and turn the lens towards the advance lever. To mount lenses, match the red dot on the lens with the red dot on the camera body, turn the lens towards the VF window until it locks into place. IIIS Lens Buying Tips: There are two spring loaded levers on the back of the lenses. When removed from the camera, the lenses automatically close down to the smallest aperture. Push each of the spring loaded levers in the opposite direction, to make sure the apertures open up without any hesitation or binding. Shine a light thru both ends of the lens to see if there is haze, lens scratches, or fungus. Make sure the lens helical turns smoothly and easily. IF you hear a metal gear sound, the lens needs a lube job. The last step is to mount the lens on the body. Make sure the lens and the aperture control wheel works smoothly together, not to mention the RF coupling. 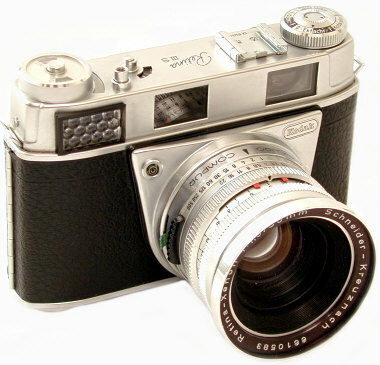 Not ALL Retina Reflex lenses engage the IIIS rangefinder. Look on the rear of the lens for the RF cam slot (shown at the 9 to 11 o'clock position in this pic). If there is no RF cam, that lens is best for the Retina Reflex only, though it can still be used on the IIIS by scale focusing only. On the left is the IIIS with Schneider 28/4 Curtagon and the superb new retro style 28 Voigtlander metal brightline finder. The importance of a 28 mm lens is often overlooked, until you discover there none were made for your camera, like the Retina IIIC, Retina IIIc, Voigtlander Vitessa, Agfa Ambi Silette, Braun Super II, Voigtlander Prominent, Voigtlander Bessamatic/Ultramatic. On the right is the 35/2.8 Schneider Curtagon. The 50/1.9 Xenon or Heligon are the fastest IIIS lenses, their closest speed competitors just f/2.8. The 135/4 Schneider Tele-Xenar and the 85/4 Schneider Tele-Arton, the lack of a fast portrait lens is arguably the weakest link in the IIIS lens lineup. The Retina IIIS mounting the 200/4.8 Schneider Tele-Xenar and the Tewe 35-200 finder. While there is no RF coupling, the 200 is fully usable at infinity by scale focusing. The 35-200 Tewe zoom finder has parallax compensation, and even a clip on 28 lens attachment. The weak point in IIIS to SLR lens compatibility are the Retina SLRs. Not only are they notoriously difficult to work on, the pentaprisms often have silvering problems, and the meters are none too reliable. Solution? Strangely enough, it is Voigtlander to the rescue, Voigtlander Bessamatic and Ultramatic (the best leaf shutter 35 SLRs). 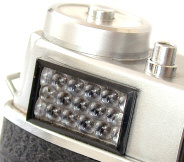 The IIIS lenses can be modified to fit on the Voigtlanders with full lens to body and meter compatibility. This is especially attractive because most Retina IIIS lenses are a good deal easier to find than most classic Voigtlander Bessamatic / Ultramatic lenses. Yet another option is the use the fabulous Deckel adapter to mount your IIIS, Retina SLR, or Voigtlander Bessamatic / Ultramatic lenses on your favorite Pentax screw mount body. What's a Deckel? 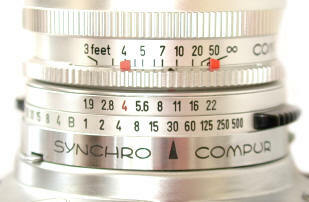 Deckel is the manufacturer of Compur shutters, and most likely the inventor of the Retina/Voigtlander camera mount. You don't know where to buy this wonderful adapter? Why, CameraQuest of course, where else? Combine the Deckel adapter to a Pentax screw mount adapter to use your IIIS, Retina Reflex, or Voigtlander SLR lenses on your Canon FD, Canon EOS, Miranda, Konica Autoreflex, or Pentax K mount camera, among others. Some of these body combinations give the benefit of features never available to the IIIS, such as motor drive, TTL flash, and aperture priority AE. Sharp inexpensive Schneider or Rodenstock 28, 35, 50, 85, and 135 lenses are the largest lens lineup you will likely find on an interchangeable lens leaf shutter rangefinder. 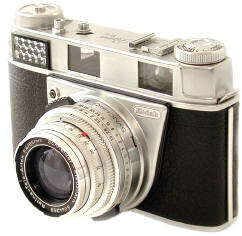 So far as I know, the 28 is the only 28 offered on classic leaf shutter rangefinders. Parallax corrected 35, 50, 85, 135 framelines AUTOMATICALLY appear in the finder, just like the much more expensive Leica M series. The QUIET IIIS leaf shutter is actually quieter than a Leica M6! The 1/500th Flash Sync is much higher than the Leica M's anemic 1/50th sync. Amazingly small 85/4 Schneider Tele-Arton is about the size of the 50/2.8. The all metal chrome lenses are nicely finished, not cheap plastic. To use the Self Timer: just put turn the flash sync selector to "V." Unfortunately cameras like the Leica M6 and Bessa R2 have no self timer. You won't miss it until you don't have one. Double Exposures are EASY with the IIIS. Just take your shot, push in the rewind button, and take another. The counter will then be off if you don't re-set it, but you will have your double -- or triple -- or whatever exposures. IIIS lenses can be used on the Retina S, III, and IV SLRs, and vice versa. 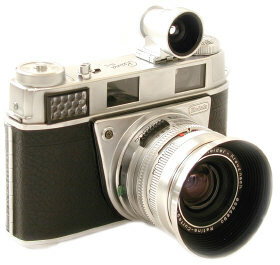 This is a UNIQUE feature in vintage rangefinders. Imagine how nice it would be to use Leica M lenses on the Leica R. Unfortunately I don't much like Retina SLRs, as they have poor reliability, prisms often de-silver with age, and are almost impossible to get repaired. 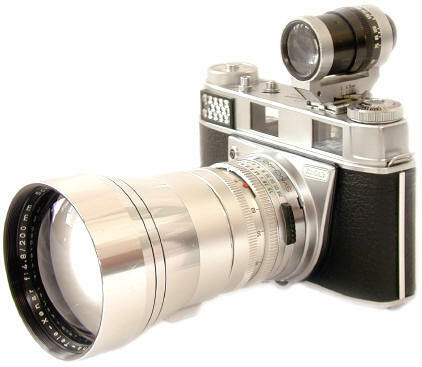 Be aware that after the IIIS was discontinued, the IIIS RF cam was also eliminated, so later Retina SLR lenses do not have the rangefinder coupling cam to mate to the IIIS rangefinder. The teles have not so close focusing: the 85/4 Schneider Tele-Arton focuses only to 6 feet, the 135/4 Schneider Tele-Xenar focuses only to a painful 13 feet or so. The Viewfinder has a strong tendency to fog and haze up over the years. A cleaning by a Retina specialist will likely be required. The viewfinder / rangefinder is adequate but not bright RF/VF. The non-projected frame brightlines are prone to flare with age. The VERY complicated internal IIIS design tends to need more than its share of servicing. Unfortunately good IIIS repair techs are difficult to find. Retina IIIS's, like all the later Retinas, have a strong tendency to gum up and stop working after years of storage. Would you believe Kodak used an 18" string to connect the lens LVS coupling to the meter over and under and around seven pulleys? Well, believe it. You will probably need an overhaul to get your IIIS back to top notch shape. All controls, especially focus and changing the f/stops and shutter speeds should work easily and smoothly. IF not, best to have it serviced. Retina IIIS has a reputation for being hard to work on. Many repairmen refuse to attempt it at all, or indeed any of the later Retinas. It takes a Retina specialist to get it right. Should You Buy a IIIS as a Shooter? Like most everything else in life, it's a trade off. How do you weigh a low cost quality RF outfit with SLR lens compatibility VS. a slow working design and difficult to find servicing? A bargain to be sure, a full IIIS outfit with all 6 focal length lenses costs MUCH less than many used Leica lenses, not to mention new Leica lenses (without a camera). It's your call. Left to Right: 28/4, 35/2.8, 50/1.9, 85/4, 135/4, 200/4.8 Schneider lenses. Notice the silver colored finish, said to be an early and obsolete form of plastic called "chrome metal." The history and origination of this "metal" stuff is unknown, as "metal" was completely superfluous and unneeded in camera construction with the invention of today's glorious do everything plastics. The IIIS has some outstanding features, especially for its modest price range. 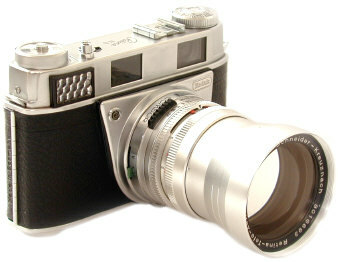 The Retina IIIS cross-platform Rangefinder-SLR lens compatibility is unique. Niceties include quality lenses, electronic flash sync at all speeds, very quiet shutter, large lens lineup 28-135 (plus optional 200 and 2x converter), and good RF/VF. It's also awkward to use, especially the LVS shutter exposure lock, interlocking film counter, and for many, the bottom lever film advance. Hmm. Yet if you can live with its foibles, the Retina IIIS will reward you with a quality low cost RF system. Revised: November 26, 2003 . Copyright � 2003 Stephen Gandy. All rights reserved. This means you may NOT copy and re-use the text or the pictures in ANY other internet or printed publication of ANY kind. Information in this document is subject to change without notice. Other products and companies referred to herein are trademarks or registered trademarks of their respective companies or mark holders.